"'Behold Tol Brandir!' said Aragorn, pointing south to the tall peak. 'Upon the left stands Amon Lhaw, and upon the right in Amon Hen the Hills of Hearing and of Sight. In the days of the great kings there were high seats upon them, and watch was kept there. But it is said that no foot of man or beast has ever been set upon Tol Brandir. Ere the shade of night falls we shall come to them. I hear the endless voice of Rauros calling' . . . The day came like fire and smoke. Low in the East there were black bars of cloud like the fumes of a great burning. The rising sun lit them from beneath with flames of murky red; but soon it climbed above them into a clearly sky. 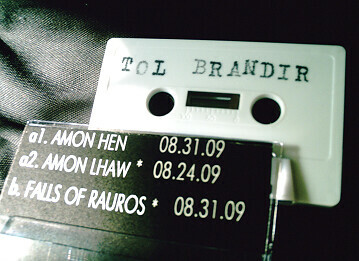 The summit of Tol Brandir was tipped with gold. Frodo looked out eastward and gazed at the tall island. Its sides sprang sheer out of the running water. High up above the tall cliffs were steep slopes upon which trees climbed, mounting one head above another; and above them again were grey faces of inaccessible rock, crowned by a great spire of stone. Many birds were circling about it, but no sign of living things could be seen" (J.R.R. Tolkien, Fellowship of the Ring).